The terrorist outfit, Babbar Khalsa International, used YouTube to rope in three youngsters, recently arrested in Shingar cinema blast case along with their mastermind Harminder Singh. Following the arrest of four youths in Vienna (Austria) who were allegedly planning to attack Dera Radhaswami chief Baba Gurinder Singh, the police here has beefed up security at Dera Beas. Alarmed at the worrisome number of cases of zoonotic diseases, which could be transmitted from animals to humans, the Centre has set up a high- level committee of experts from the Indian Council of Medical Research and the Indian Council of Agricultural Research to tackle the problem. Dr Vikramdeep Monga, a young scientist of the Indo-Soviet Friendship College of Pharmacy here, has designed and synthesised new molecules, which will help in developing more effective drugs for curing epilepsy, Alzheimer’s disease, Parkinson’s disease and other neurological disorders. Politicians held centre stage as the curtains came down on the 75th birth anniversary celebrations of Shiv Kumar Batalvi at a local marriage palace today. Today the proceedings, comprising primarily speeches by SAD-BJP politicians, were shifted from the basement to an open place on the premises of the resort. For Sunil Kumar, a local farmer, the possession of a big landholding of 45 acres is not a matter of rejoicing for he is cultivating only four acres of it as little canal water is available to him. A Dubai court on Thursday acquitted one Punjabi youth of murder charge and granted bail to five others. They all have been released from the jail. As many as 13 Punjabi, two Pakistani and one Bangladeshi youths were lodged in the Dubai jail for the past over one year for allegedly murdering Ashok Kumar of Kapurthala. The BSF authorities have put the troops deployed alongside the Indo-Pak border on high alert to disallow the anti-India elements, sitting in neighbouring Pakistan to play any mischief during the flood-like situation. Chief Minister and chairman of the Bhai Kanayia Trust Parkash Singh Badal today gave nod for initiating the process for the renewal of Bhai Ghanhya Sehat Sewa Scheme w.e.f February 1, 2011, in view of enormous benefits available under the scheme. The present scheme expires on January 31, 2011. Chief Minister Parkash Singh Badal today gave a clarion call to all government, social, non-government and individuals to come forward for protecting and planting trees across the state to ensure a pollution-free environment. In a significant decision, Punjab Chief Minister Parkash Singh Badal today gave approval for the channelisation of Buddha Nullah at a cost of Rs 63 crore. Following news reports carried in the Tribune, the Punjab Pollution Control Board (PPCB) has taken M/s Jaypee Himachal Cement Grinding and Blending Unit, Bagheri, with the Clincker Storage Yard at Dehni village, Anandpur Sahib, to task and penalised these with Rs 10 lakh. Chief Minister Parkash Singh Badal today approved to enhance the honorarium of Anganwari workers and helpers by Rs 150 and Rs 75 per month, respectively. Fighting against odds and winning has been a habit for 19-year-old Rahul Duggal whose determination has won him many accolades from all quarters. The latest comes from Punjab Chief Minister Parkash Singh Badal, in the form of an honour, monetary help and a promise of life-long assistance. Twenty-two persons were injured, of which two are critical, when the bus they were travelling in met with an accident near DCM Engineering Factory here today. Most passengers were pilgrims, either from Naina Devi or Amarnath. The CBI counsel today moved an application under Section 340 of the CrPc against Kamaljit Singh, the main witness in the murder case of Harpreet Kaur, daughter of former SGPC chief Bibi Jagir Kaur. Chandigarh, July 30 Misusing a car and non-compliance with court orders has cost the then SHO of Samrala police station Arvind Puri dear. The Punjab and Haryana High Court has not only asked him to pay for the repair and service of the damaged vehicle, but also “Rs 25,000 to the petitioner towards costs”. The directions were issued after Justice Surya Kant accepted his unconditional apology. Armed with a news report carried in these columns, Punjab’s former Director-General of Police SS Virk today alleged that the investigating officer (IO), in the corruption case against him, was facing inquiries for his alleged role in fake encounters. With this, Virk has raised questions on the fairness of the probe being carried out by Senior Superintendent of Police Paramraj Singh Umranangal. The death of a local youth, Ramandeep Singh, under mysterious circumstances has snowballed into a major controversy as a kin of the deceased alleged that he became a victim of honour killing, while the police authorities dubbed it as a case of suicide. The body of Ramandeep Singh, which was cut into pieces, was found on the Abohar-Malout railway track near the level crossing near Seeto Guno road this morning. The body was identified from the cell phone found on it by the General Railway Police (GRP) personnel. The police said BKI workers came across a video of the three youths on YouTube. Three accused Jaswinder Singh of Rajpura, Manjinder Singh of Hussainpura village and Gurjant Singh of Jangpura village got injured while protesting against Ashutosh of the Divya Jyoti Jagran Sansthan in Ludhiana in December 2009. “Their photographs, videos and contact numbers were uploaded on the website through which terrorist outfits in Germany, England and Pakistan contacted them. First, money worth lakhs poured in for them following which the BKI contacted the three youths over phone several times and instigated them to plant bombs at Shingar cinema in Ludhiana,” the officials said. The same accused were roped in to conduct blasts in Ambala on April 13 and on April 21 near Sat Narain Mandir in Patiala. Fortunately, not many got injured in these incidents, a senior police official said. He said there was no specific motive behind these blasts; it was just aimed at creating disharmony, panic and disrupting peace. During the investigation, the three arrested accused admitted to have received money worth lakhs from political and religious leaders (in India and abroad) immediately after receiving injuries during the protest in Ludhiana. However later, they allegedly received money with explosives from Harminder Singh. Harminder handed over the latest haul of explosives to these youths at Rajpura in March. They also received funds to contest the coming SGPC elections and were confident of becoming members of the Sikh body. Meanwhile, SSP Sukhminder Singh Mann said the police would soon present a challan in court. It is pertinent to mention here that the Vienna police had nabbed four persons for hatching a conspiracy to attack Dera Beas chief, who has a great number of followers in India and abroad. Gurmeet Singh Chauhan, SSP, Amritsar, rural police, said a general alert has been sounded after the Vienna incident wherein several persons had been nabbed with arms during religious congregation of the Dera. “However, the Radhaswami chief already has tight security net, both personal as well as of the Punjab police commandoes”, he said, adding, “We are still waiting for the details of the incident. At this moment we did not know how many persons have been involved.” Baba Gurinder, who is on his scheduled religious tour to European countries, is expected to return in the first week of September. The committee has three veterinary experts and equal number of medical professionals to handle the task. The authorities concerned of the Centre were alerted by the Department of Veterinary Public Health of the Guru Angad Dev Veterinary and Animal Sciences University, Ludhiana, and the Union government-run Regional Disease Diagnostic Laboratory (RDDL)located here. There are about 50 zoonotic diseases such as swine flu, bird flu, bovine TB and brucellosis. The RDDL got worried when it received complaints from various veterinary officers, para-veterinary staff and dairy farmers with regard to body aches, head ache, fever and impotency etc. It got the blood samples of 1,369 veterinary professionals and found 115 of them suffering from brucellosis, a contagious bacterial disease which transmits from infected animals to human beings. But interestingly most of the medical professionals, who deal with human beings, often fail to diagnose the diseases such as brucellosis because of the limited exposure to such cases. “Some medical professionals, working in big hospitals sent the blood samples to laboratories for testing. But most of the medical professionals continue to treat such patients for other common diseases such as typhoid, viral fever etc,” said Dr Arun Kumar, Joint Director, RDDL. Dr J P S Gill, head of the Department of Veterinary Public Health, who is a member of the committee, said the department had been monitoring the incidence of brucellosis among veterinary staff for the past few years. “On average, we have found about 10 per cent veterinary staff members infected by the disease”, said Dr Gill. However, the RDDL has found about 9 per cent veterinary staff infected by brucellosis, which can also lead to impotence of human beings. “Though veterinary staff is checked on random basis. However, as no epidemiological study had been conducted in case of dairy farmers, who remain in direct contact with cattle, nothing could be said with regard of the prevalence of zoonotic diseases among them,” Dr Arun Kumar said. “We will conduct the screening of nearly 5,000 veterinary professionals and dairy farmers to find out more cases of zoonotic diseases. Funds have also been allocated to the RDDL from the Rashtriya Krishi Vikas Yojana”, Dr Kumar added. The National Institute of Neurological Disorder and Stroke (NINDS), USA, signed an agreement with the scientist a few days ago for conducting clinical trials of these molecules on animals. This international collaboration aims at promoting the discovery of new drugs and effective delivery of useful agents to specific locations within the central nervous system. The rational drug design would be based on the knowledge of three-dimensional structures and function of crucial receptor molecules. Major goals the NINDS has identified with new molecules for research includes harnessing the power of molecular genetics to understand neurological disorders by defining healthy function and to develop better treatments, unravel complexities of information transfer within the brain and how the central nervous system communicates with all other major organ systems, gain a greater understanding of brain mechanisms underlying higher mental functions and complex behaviors and to develop more effective therapies and prevention strategies. Adding that funds required for the further research would be provided by this international institute, Dr Monga claimed that the results from his newly designed molecules would go a long way in curing these diseases. This young scientist of pharmaceutical chemistry believes that this is the time of accelerating progress and increasing hope in the battle against brain diseases. The chief guest, Deputy Chief Minister Sukhbir Badal, first visited the Shiv Kumar Batalvi Cultural Centre, which is in a dilapidated condition, before coming to the venue of the function. Sukhbir said the neglected complex would be turned into a state-of-the-art auditorium within a year. Sukhbir also asked the Punjabi University Vice-Chancellor, Dr Jaspal Singh, who was present on the occasion, to promote Batalvi’s son to the post of a lecturer in the university. The announcer’s faux pas of not introducing to the audience Aruna Shiv Batalvi, the writer’s wife, flummoxed many. She later made amends with an apology. Incongruously, Batala MLA Jagdeesh Sahni, who was completely ignored by the organisers yesterday, urged Sukhbir to look into the problems faced by the industrialists of Batala. Punjab Speaker Nirmal Singh Kahlon, while paying lip service to Batalvi, was quick to ask the Deputy Chief Minister to provide funds for laying new roads in his Assembly segment. Agriculture Minister Sucha Singh Langah also highlighted the problems being faced by his voters. Dr Jaspal Singh made an emotional speech about Batalvi’s contribution to Punjabi literature. Interestingly, an ardas was offered for the late writer as well as for the well being of Surinder Kaur Badal, the mother of Sukhbir. There was a minor controversy over Batalvi’s date of birth, which, according to his family members, is July 23, 1936. However, the writer’s date of birth on his matriculation certificate is October 8, 1937. The family members say that the date of birth given by his wife was correct. Later Sukhbir presented the newly instituted Shiv Kumar Batavi award to his wife, Aruna Batalvi. Gurcharan Singh, a farmer of Acharhhiki village, has turned a marginal farmer as he can’t cultivate more than 2.5 acres of land despite owning about 18 acres due to absence of canal water. The acute shortage of canal water has driven Jaswinder Singh, sarpanch of Usman Khera village, to cultivate only 20 acres of land out of a total of 150 acres owned by him ever since he took up agriculture as his permanent avocation 25 years ago. Thousands of acres of land in a number of villages of Abohar subdivision and situated near the Punjab-Rajasthan border at the tail ends of various irrigation channels has been lying vacant for the past many decades as these areas have never been supplied with enough canal water by the successive governments of Punjab. “For us the independence of the country does not hold any meaning as we have not been given adequate quantity of canal water to let us cultivate our landholdings to produce and earn enough to improve our economic conditions,” pointed out a cross- section of farmers, adding that the salty underground water had also added to their woes. While the land prices, which have been ranging between Rs 5 lakh and Rs 7 lakh per acre, have not seen a significant hike during the past many decades, the farmers of the region are getting little lease money, ranging from Rs 4,000 to Rs 8,000 per acre per annum, in lieu of leasing their landholdings as compared to the lease money ranging between Rs 30,000 to Rs 35,000 available to farmers in other parts of Punjab and even in Sriganganagar district of Rajasthan. Farmers are dependent mostly on the rains and hence carry out agricultural operations accordingly. Whatever water is being supplied to them through irrigation channels is not enough to irrigate their landholdings even once, they claim, adding that they have been buying water from Rajasthan for drinking purposes. “If this area gets enough rains, then we go for cultivation of moong and guar crops in the vacant land. In case of less rains, we are left with no other option than to keep our lands vacant,” said Gurdeep Singh of Shergarh village, who cultivates three acres out of a total of 17 acres. “The farmers of Sriganganagar are better placed as they get enough water from the Gang canal to produce bumper crops of wheat and cotton,” pointed out Tejwinder Singh Aulakh, former sarpanch of Kallar Khera village, who owns 71 acres of land, adding that they wanted that their area must be attached with Sriganganagar so that they could get canal water in a sufficient quantity. Sukhdev Singh Chahal, chief agriculture officer, while admitting that a significant area had remained deprived of the canal water, pointed out that irrigation department authorities were trying to overcome this problem by running the irrigation channels in rotation. Baljit Singh, person in charge of the Dubai unit of the All-India Sikh Students Federation (AISSF), while talking to TNS over the phone from Dubai said one of the alleged accused, Jatinder, has been acquitted of the murder charge. Five others who were facing trial - Charanjit Singh, Harpal Singh, Amarjit, Lakhwinder Singh and Buta Singh -had been granted bail by the court, he added. The other Punjabi youths who are still lodged in the jail and facing trial in the case are Sukhdev Pal Singh, Surinder Pal Singh, Hunny, Sunil Masih, Vijay Kumar, Bhupinder Singh, Ramji and Makhan Lal. Meanwhile, AISSF president Karnail Singh Peer Mohammad claimed that Agyawati, mother of deceased Ashok Kumar, has filed an affidavit in the trial court requesting for granting a general amnesty to all alleged accused. “The affidavit is in the process of verification by the court and after completing all legal formalities of 12 Punjabi, two Pakistani and one Bangladeshi youth at present facing trial will hopefully be granted general pardon by the court as per the local laws in the next few weeks,” he claimed. Baljit Singh said efforts had been initiated to send Jatinder back home in Punjab after completing legal formalities. The additional troops have been put on duty in the area falling between the Zero Line of the Indo-Pak border and cobra fencing erected in its close vicinity and alongside the cobra fencing so that these areas could be sanitised to prevent the movement of unscrupulous elements. It was learnt that though no incident connected with crossing of border by anti-nation elements sitting across the zero line during such situations had come to light so far, the BSF had received inputs that such elements might make attempts to enter the Indian territory during the monsoon. Information said the Sutlej and the Ravi had been causing huge damages to the cobra fencing and border tracks whenever they were in spate during the monsoons and, hence, would make the border prone to infiltration. “Eight BOPs in the Ferozepur sector, including Tapo, Mohamdi Wala, DT Mal, Gajni Wala and DRD Nath are flood prone and we have taken measures as per standing order procedure to deal with the situation,” said Rajesh Gupta, DIG, BSF, Ferozepur, adding that the BSF was prepared to execute its operational responsibilities. A decision to this effect was taken by Badal while reviewing the progress of the scheme for the previous six months at the meeting of the trust held here at Chief Minister's residence this afternoon. It was informed at the meeting that 8,721 beneficiaries have availed cashless treatment to the tune of Rs 12 crore. They Bhai Kanayia Sehat Sewa Scheme providing cashless treatment up to Rs 1.5 lakh on family floater basis, to the beneficiaries in nearly 250 approved private hospitals was started afresh w.e.f February 1, 2010. Badal said the state would initiate the ‘Project Green’ in five corporation cities of Jalandhar, Amritsar, Bathinda, Ludhiana and Mohali. Badal asked the Chief Secretary to chalk out the modalities to make tree plantation mandatory for all new residential constructions and to be included in the process of passing of the layout plan of any house by the authorities. He further directed PUDA to hire the services of the reputed companies for landscaping and plantation in a planned manner. He also directed the Rural Development and Panchayats Department to identify the maximum rural vacant land, where plantation could be done on mass scale. A decision to this effect was taken by Badal at a high-level meeting here. The Chief Minister directed the Drainage Department to complete the project of 44 km from Kumkalan to Walipur Kalan village positively within three months. Besides, Badal also gave nod for the re-structuring and strengthening of the 45.73-km abandoned canal, starting from Walipur Kalan (Ludhiana) and ending at head of 6R minor in the Ferozepur district at a cost of Rs 60 crore. This canal, with the intake capacity of 220 cusecs of treated water of Buddha Nullah, would irrigate area of nearly 40,000 acres of about 80 villages. He asked the Irrigation Department to prepare a detailed plan of the project to ensure its early execution. The action came when the board found that the Bagheri unit with the clinker yard carried out clinker storage and dumping activities at Bikkon village without its consent and mandatory air pollution control measure. The board found that the land under question was found covered under a section of the Punjab Land Preservation Act. The no objection certificate from the Forest Department was also not obtained. PPCB deputy director (PR) Dr Charanjit Singh said a decision of encashment of bank guarantee of Rs 10 lakh was taken after personally listening to firm’s vice-president Brig KK Talwar who argued that the board could not encash the guarantee at Dehni as it was for Bikkon village only. Board Chairman Rajat Aggarwal decided that the contentions of the firm were not tenable as it earlier violated the Pollution Control laws at Bikkon and now at Dehni despite warnings. Aggarwal further ordered that another bank guarantee of Rs 20 lakh be immediately obtained as an assurance that the firm would not start operations at any site without obtaining the requisite permission from the board. A decision to this effect was taken by the Chief Minister at a meeting here at the Chief Minister’s residence with the delegations of the Anganwari Mulazam Union, Punjab, and the Punjab Anganwari Employees Union (CITU), led by its presidents Hargobind Kaur and Usha Rani this morning. With this increase in the honorarium, anganwari workers and helpers would now get Rs 2,250 and 1,125 per month, respectively. Responding to other issues raised by members of the delegations, Badal agreed in principle to waive off the condition of the maximum age of 44 years for the promotion from an anganwari worker to supervisor. The Principal Secretary, social security development, assured Badal that the process for the promotion to the 288 vacant posts of supervisor from anganwari workers would be completed within 45 days. The Chief Minister also directed the Finance Department to sanction Rs 5.11 crore to provide gas stove and cylinder in all 25,545 centres for the preparation of food in hygienic and pollution-free conditions. He also directed the Health and Education departments to explore the possibility of the adjustment of anganwari workers as auxiliary nurse midwifes (ANMs) and ETT teachers, provided they fulfil the minimum required qualifications for these posts. 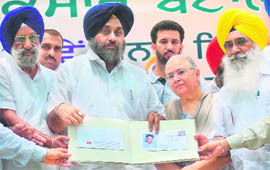 Rahul was yesterday felicitated by Badal at the latter's residence in Chandigarh. So impressed was Badal to meet Rahul that he assured him of financial and personal assistance, in his education and treatment as well. And why not! Rahul has fought grave odds to reach where he is, never letting his disability become a deterrent in his success. The student of SCD Government College for Boys, dependent on a writer to write his papers, had recently proved this by topping BCA-II in Ludhiana district with 80 per cent marks. Rahul has been a topper throughout. He topped the district in Class X and XII boards held by the PSEB. Rahul had topped the district In BCA-I with 78 per cent marks. The Tribune highlighted his success story. Rahul was afflicted with mylites post viral at the age of nine, following which he lost the ability to walk and talk. Though denied admission in any institute here, Rahul did not give up on his dream to study. Confined to bed, he appeared for his Class VIII PSEB examinations as a private candidate, with the help of a writer and there has been no looking back since then. "It was not easy. I studied till late night with my mother as she held the book for me and solved questions that I memorised,” said Rahul, recalling his days of struggle. The bus was on its way from Katra to Chandigarh when a eucalyptus tree had fallen in the middle of road. In order to avoid head-on collision with the fallen tree, the driver turned the bus to a safer side. Unfortunately, the bus collided with trees grown besides Bist-Doab canal before turning down to the left. Meanwhile, the injured were admitted to PGIMER, Chandigarh. One of the seriously injured has been identified as Bharat Prashad Gupta, a native of Bihar, while the identity of another youth remains unknown. Some injured include Jaggi from Udhampur, Bhushan Narayan from Panipat, Saraswati and her husband Arun Chaudhary from Bihar, Aarti Gupta from Nepal, Ashok Kumar from Jammu, Kiran Gupta from Bihar, Gaurav Arora and his wife Sunita from Madhya Pradesh, Sohal Ghulam from Srinagar, Shilpi Gupta from Bihar, Sushil Sharma from Chandigarh, Sanjay Bakshi from Chandigarh, Rajinder Singh from Chandigarh, Pehma from Ladakh and others. According to information, they were administered first-aid and were discharged. As the hearing in the case resumed in the CBI special court here today, the CBI counsel stated that Kamaljit had mislead the judiciary by earlier giving statements and other documents accusing Bibi Jagir Kaur of being the main accused behind the murder of Harpreet and later turning hostile. Further claiming that Kamaljit had taken Rs 3 crore from Bibi Jagir Kaur for turning hostile, the CBI counsel demanded action against Kamaljit under the Section 340 of the CrPc. Notably, it is only in rare cases when the CBI moves application under Section 340 of the CrPc. Kamaljit’s counsel Kundan Singh Nagra sought time from the court to respond to the CBI’s plea. The main accused, Bibi Jagir Kaur, was also present in the court. The hearing would now resume tomorrow. Misusing a car and non-compliance with court orders has cost the then SHO of Samrala police station Arvind Puri dear. The Punjab and Haryana High Court has not only asked him to pay for the repair and service of the damaged vehicle, but also “Rs 25,000 to the petitioner towards costs”. The directions were issued after Justice Surya Kant accepted his unconditional apology. Khanna resident Raghbir Singh had earlier alleged implication and damage to the vehicle after the filing of a habeas corpus petition. Raghbir Singh said he had through his nephew Jitender Singh rented out a Scorpio to Karam Singh, against whom a case was later registered at Samrala police station. No allegations were made against Raghbir or Jitender. 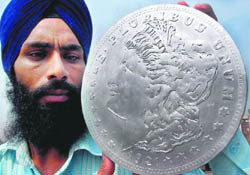 But on October 1, 2009, Jitender was picked up and their car was forcibly taken into possession. After a habeas corpus petition was filed, Raghbir and Jitender’s names were added to the FIR and vehicle was shown as seized. Taking up the matter, Justice Daya Chaudhary has issued notice of motion to the State of Punjab and other respondents for August 17. In his petition for changing the IO, Virk asserted that Umranangal was appointed with the “sole purpose that the investigation is carried out as per the dictates of the state, leading to his implication”. Quoting examples to substantiate his contentions, Virk alleged that the Government of India, on the State of Punjab’s recommendations, awarded a gallantry medal to Umranangal for the encounter of a terrorist. The award was bestowed after the Punjab Police claimed the man killed in a fierce encounter near Ropar in 1994 was militant Gurnam Singh Bandala. “But, subsequently, it was found that he was alive and a fake encounter was staged,” Virk’s counsel added. Elaborating, the counsel said: “It has only now surfaced that the medal was obtained on the basis of fake encounter and an inquiry was initiated by the Government of Punjab in 2007”. The counsel made it clear that this was not the only case. The present IO has been a part of another fake encounter of an 18-year-old. He was “eliminated on the pretext of encounter of a terrorist in Fatehgarh Sahib district,” the petitioner alleged. The Tribune report, “18 yrs on, parents get evidence, seek relief”, has been annexed with the petition. Jaspal Singh, uncle of the deceased, alleged that Ramandeep Singh was killed by a senior functionary of the office where Sukhdev Singh, father of the deceased, was working as the deceased was allegedly involved in an affair with his (senior functionary’s) daughter. He added that Ramandeep, who was 20 years old, had become a victim of honour killing. He further said that a case of honour killing was not registered against the accused by the police as it had been working under “political pressure”. He said Ramandeep’s cremation was also performed at Kauni village of Muktsar district under pressure. He claimed Ramandeep went outside his house last night after receiving a call on his cell phone and this morning his body was found lying on the track. He said Ramandeep and members of his family had also been receiving threats from the kin of the girl for the past many days. Ramandeep along with his father and other members of family was living in the official residence at the seed farm of Punjab Agriculture University (PAU) in the town. Baljinder Singh, SHO, GRP, police station, Abohar, said that prima facie it was a case of suicide. He said a postmortem of the body was conducted and the viscera would be sent for examination. He denied that the police was trying to hush up the matter by dubbing it as a suicide case. He said a case under Section 174 of the CrPC was registered as Sukhdev Singh, father of the deceased, had told him that he would make his statement in connection with the death of his son to the police authorities later. Meanwhile, the district administration has also started inquiries into the case.